In between Christmas and New Year, after everyone had left and hubby was working, I had a wonderful Pyjama day - just properly recharging on the sofa watching all the Christmas films I had recorded. I didn't even lift the laptop (hence the lack of blog posts then and my sudden urge to write a lot now!). 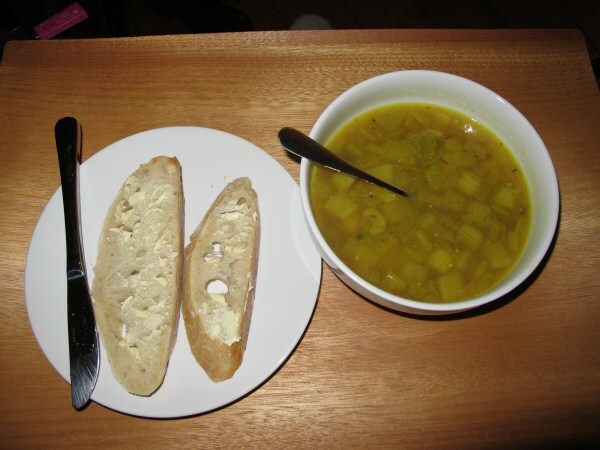 At dinner time I suddenly had the urge to make soup so raided the fridge to see what I could manage. I usually only follow recipes (and frequently change them slightly) but decided to wing it following a basic idea from the last few soups I have made! Luckily it turned out rather nice! Heat the oil in a large saucepan and gently fry the onion and garlic until soft (about 5 mins). Add the diced potato, celery and turmeric and stir. Heat gently for 1-2 mins. Add the stock and bring to the boil, add the peas, salt (may not be required if your stock is very salty so you can leave this until later and add to taste) and pepper then simmer for 20 mins or until the potatoes are soft. Serve with crusty bread. I had planned on blending it but tried it as was and loved it so I left it as a watery soup with chunks in. Even hubby approved!